Darvazeh Quran or Quran Gate is located in northeast of Shiraz in the canyon of Allah-o Akbar between ChehelMaqam Mountain and Baba-Koohi Mountain located at the exit of Shiraz towards the city of Marvdasht. This monument is located near Tavoosieh square in Shiraz. Darvazeh Quran is less than 10 meters far from KhajaviKermani tomb, less than five hundred meters far from JahanNama Garden, and less than a thousand meters far from the shrine of famous Persian poet Hafez-e Shirazi and JahanNama Garden. 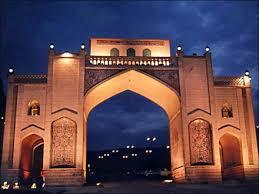 This is one of the most beautiful Islamic gates. The gate was originally built in Azod-o Doleh-e Deilami time and a Quran was placed in it bless the travelers passing beneath it. The gate was renovated during Zandiyeh Era by the order of Karim Khan Zand and a chamber was added on top of it and two large exquisite Qur‘an calligraphed by Soltan Ibrahim Ibn-e Shahrokh-e Teymoori were placed in the top chamber. These Qur‘ans, known as ―Quran-e Hefdah-Man‖ (Quran weighted 51 kg), has 24 been transferred from Darvazeh Quran to Pars Museum. Darvazeh Quran encountered lots of damages caused by several earthquakes in the Qajar period, but then repaired by Mohammad Zaki Khan-e Nouri. The monument was also called Taq-e Quran (Quran Arch) in the past. In the first few days of each month, people were going out of the city and passing from under the arch. In 1936 AD, it was destroyed by the order of Reza Khan. The current Darvazeh Quran was built by the effort of a merchant from Shiraz, near the old gate in 1949 AD. The new gate was constructed in a larger size, including a sharpened arc opening and two small entrances on the pier of each side and a rectangular room on top of the gate. In this building, some verses from the Quran are calligraphed in Sols and Naskhcalligraphs all around the gate. On top of the gate, there were two manuscripts of Quran written in Sols calligraphy attributed to Sultan Ibrahim Ibn-e Shahrokh-e Teymuri. The books were moved to Pars Museum in 1937 AD, and are still kept in there.